Back before he became a star with flicks like A Nightmare On Elm Street and Scream, Wes Craven made some cheap “exploitation” movies. He opened with 1972’s Last House On the Left and followed that five years later with 1977’s The Hills Have Eyes. While it offers a substantial improvement over the crummy House, Hills seems only sporadically interesting. Set in the middle of the desert in the US Southwest, we initially meet Fred (John Steadman), the elderly owner of a decrepit gas station. He wants out but we learn about a force that won’t let him go, and that factor also affects a young woman named Ruby (Janus Blythe). She attempts to run away from her menacing family, but it doesn’t look like she’ll make it. Into this setting enters the Carter family. On their way to California as part of a 25th anniversary celebration for father Bob (Russ Grieve) and mother Ethel (Virginia Vincent), the extended clan includes son Bobby (Robert Houston), daughters Brenda (Susan Lanier) and Lynn (Dee Wallace), Lynn’s husband Doug (Martin Speer), and their infant daughter Catherine (Brenda Marinoff). They want to explore an old silver mine near Fred’s station, and even though he warns them away from there, they continue through the deserted territory. Unfortunately, they get into an accident that disables their vehicle. Doug and Bob set out in different directions to locate help while the others wait. Some weird incidents ensue, but nothing major happens until after dark. Along the way, Bob makes it to Fred’s station and gets the scoop on the area. Decades earlier, Fred’s wife gave birth to a monster baby. 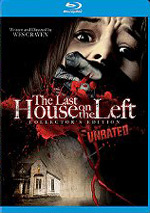 Part of my problem with The Last House on the Left stemmed from its atrocious production values and performances, and those same issues affect Hills. Make no mistake: this is an amateurish, low-budget flick, and it shows. Actually, the sets and locations seem fine, as they don’t require much investment. The film takes place in a dilapidated and spare setting, so it doesn’t need anything more than what we see. Unfortunately, the lack of money means less than stellar actors, and that negatively affects the movie. Most of the performers either overplay their roles to the point of campiness or portray the characters in dull, monotonous ways. At least Craven demonstrates much stronger filmmaking abilities than during his prior effort. That one suffered from terrible pacing and shot composition, whereas Hills seems much more accomplished in both areas. Craven builds the tension quite nicely during the movie’s first act. The story meanders somewhat during the second, but it pays off reasonably well at the climax. In addition, the movie simply looks better than did House. The latter showed terrible framing that cropped actors in odd ways and seemed awkward. Hills won’t win any plaudits for these areas, but at least it presents an acceptably well-composed image that doesn’t detract from the experience. Hills might work better without the freak elements, as the fact that Jupiter gets built up as some superhuman monster takes us away from the terror of reality. Obviously, we’re supposed to identify with the Carters, and in spite of the bad acting, we do. However, it’s tough to connect with the situation because it’s so unrealistic. If the flick presented more believeable and human antagonists, it’d be scarier because we could see the situation happen to us. This become more of a Deliverance thing instead of horror/fantasy. Jupiter and clan offer such goofy and broad villains that I find it tough to take them seriously. Still, it’s hard to dislike a movie in which some freaks plan to eat a baby. The Hills Have Eyes seems alternately cheesy, cheap, and silly, but it also sometimes comes across as a nail-biter with creative elements that give it some life. Hills isn’t a classic, and it has more than a few flaws, but it connects occasionally. The Hills Have Eyes appears in an aspect ratio of approximately 1.85:1 on this Blu-ray Disc. An inexpensive movie from 1977, Hills showed its age and origins. Sharpness seemed fairly drab. Shot 16mm, the movie showed lackluster definition that tended toward the soft side. This wasn’t unexpected, though, and the image showed acceptable clarity given its photographic roots. I noticed no issues connected to jagged edges or shimmering, and the movie seemed to lack any edge enhancement. Print flaws stayed pretty minor given the flick’s age. I noticed a few specks, some small nicks and marks, and the occasional thin vertical line, but the film usually remained reasonably clean. In theory, Eyes should have presented a pretty broad palette, especially via the daytime shots that appeared at the movie’s opening. However, the colors generally looked bland. The tones lacked much dimensionality, so they seemed thin and flat. Black levels also tended toward inkiness and didn’t display much depth. They were stronger than the colors, but they still didn’t demonstrate great density. Shadows occasionally came across as acceptably defined, but they usually were moderately opaque. When I considered the age and budget of Eyes, I thought the image seemed passable, but objectively, it didn’t look too good. I thought the LPCM monaural audio quality showed its age as well. Speech fared poorly, as the lines consistently sounded brittle and edgy. Expect a lot of sibilance from the dialogue as well as a generally harsh tone. I could understand the lines but they sounded terrible. Effects showed some distortion as well - especially in louder moments – and they failed to display much range. Music demonstrated moderately stronger dynamics but still was fairly restricted and lackluster. I graded this one on a curve due to the film’s age/budget, but it still didn’t earn a mark above “C—“. How did the Blu-ray compare to the DVD from 2003? Audio offered obvious alterations, as the 2003 version came with 5.1 remixes. Those weren’t especially effective, but I thought they were less distorted and rough when compared with the shrill Blu-ray track. At least visuals showed improvements. Even with its flaws, the Blu-ray came across as better defined and more natural. No one should expect miracles, though, as this entire package was “sow’s ear” territory. The 2016 Blu-ray mixes old and new extras, and we find three separate audio commentaries. Also found on the 2003 DVD, the first comes from writer/director Wes Craven and producer Peter Locke. The pair sit together for their running, screen-specific track. For the most part, they present a fairly average discussion. Craven and Locke touch on a mix of topics such as the inspiration for the story and alterations from the original script, locations, the challenges caused by the film’s very low budget, demands made by the MPAA to get Hills an “R” rating, and notes about the actors and crew. They give us a reasonable amount of information connected to the flick, but they just watch the movie and crack on some of its cheesier moments much of the time. The commentary sags periodically, as it includes more than a few dead spots. Craven and Locke enjoy a good enough chemistry to make this a fairly enjoyable piece, but it rarely becomes above average. For the second track, we hear from actors Martin Speer, Susan Lanier, Janus Blythe and Michael Berryman. Along with moderator Michael Felsher, the performers discuss how they got into acting and what led them to the film, working with Wes Craven, and various experiences during the shoot. Though not without merit, this commentary seems lackluster at best. The actors toss out occasional nuggets of value but they often seem to lack many interesting notes to tell us. This leads to a mediocre track. During the third commentary, we get thoughts from film historian Mikel J. Koven. He presents a running, screen-specific chat that looks at tales that influenced Hills as well as interpretation of the film, remakes/sequels, and other Craven works. Koven devotes the vast majority of his commentary to information about “Sawney Bean”, a Scottish legend that inspired Hills. A little of this goes a long way, and Koven spends way too much time with “Sawney Bean”. Some good information does result, but I would’ve preferred a chat that cast a broader net. Next comes the 54-minute, 35-second Looking Back on The Hills Have Eyes. It offers notes from Craven, Locke, Blythe, Lanier, Berryman, director of photography Eric Saarinen, and actors Robert Houston and Dee Wallace. “Looking Back” starts with a discussion of Craven’s background, how he decided to make a second horror flick, the story’s genesis, location scouts, and casting. It then delves into many elements of the production, with an emphasis on anecdotes from the set. The program concludes with issues related to the film’s rating, its reception and its legacy. Though a little slow paced at times, “Looking Back” tells its tale fairly concisely and efficiently. It goes through all the appropriate aspects of the production and does so cleanly. It’s not the most scintillating documentary I’ve seen, but it does its job fairly well. After this we find an Alternate Ending that lasts 11 minutes, 34 seconds. It doesn’t seem substantially different from the theatrical conclusion, but it makes for a decent addition to the disc nonetheless. Note that the Blu-ray offers viewers the choice of the movie’s theatrical cut or a version that uses the alternate ending. We can also screen the alternate ending with three different commentary options that come from the participants discussed earlier. That doesn’t mean their remarks address the alternate ending, though. Oddly, the disc just reuses the comments for the theatrical finale and plays them over the alternate version. This creates many disconnects between the notes and the onscreen action and makes the optional commentary options useless. We hear more from actor Martin Speer during a 2016 interview. Family Business runs 16 minutes, eight seconds and provides Speer’s thoughts about how he got his job and aspects of performance, memories of the shoot, and the film’s legacy. Some of this repeats from the commentary, but Speer still offers a good overview. The Desert Sessions goes for 11 minutes and gives us an interview with composer Don Peake. He chats about what brought him to the film, his score and the movie’s afterlife. This becomes a short but solid summary. After this we get 18 minutes, 57 seconds of Outtakes. These act mainly as a blooper reel, but they’re more rough-hewn than what we usually find. That makes them more interesting than normal. Next we find two trailers. We discover a US ad as well as a German clip. It’s a trip to see some of the material dubbed in Deutsch. In addition, we get four TV Spots. In the Image Gallery we locate 40 stills. These mostly focus on publicity materials, though we also get a few shots from the set. It’s a decent collection. This “Limited Edition” finishes with some non-disc-based materials. Along with a 40-page booklet, we discover six postcards and a reversible poster. Only the booklet demonstrates value, but the other elements seem acceptable. Although it represented a significant improvement from his first film, Wes Craven’s The Hills Have Eyes remains only intermittently positive. It offers some intense and intriguing elements but poor acting and cheap production values hinder its success. The Blu-ray provides flawed picture and audio along with a large set of supplements. Despite some effective moments, Hills remains erratic.